When someone asks the question ”what is your favorite place you’ve ever visited?” I smile, and without hesitation I give my response. We visited Ireland with our 11 month old son and our friends. 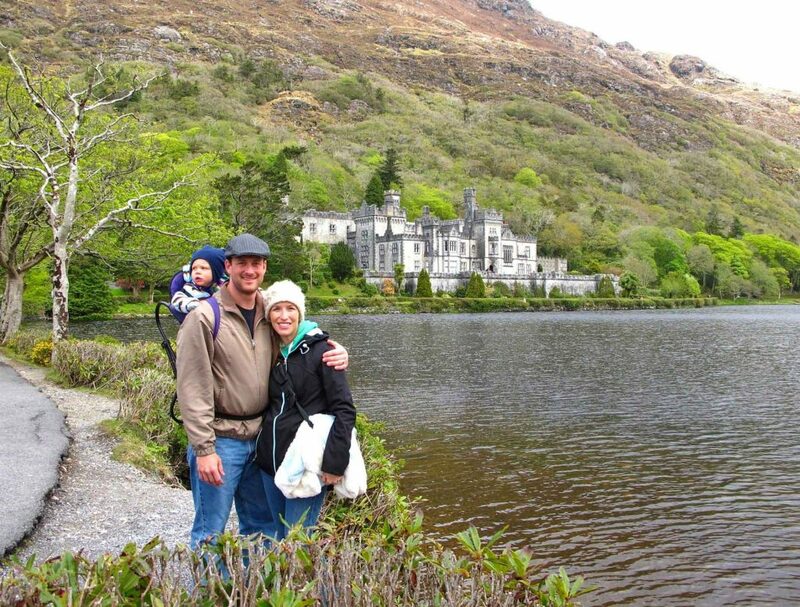 This was our first international trip with a baby, and I’m here to tell you that traveling around Ireland with children is very easy! The very best way to ensure you can experience all that the Emerald Isle has to offer, especially if traveling to Ireland with a baby or toddler, is by renting a car. This gives you the freedom to up and go as you please. Just be aware, they drive on the other side of the road! This was a major adjustment for us being from the US. We travel with a lightweight, compact umbrella stroller so it was not much effort to bring, but mainly used a baby hiking carrier on this trip. We didn’t use the stroller as much because of the terrain in many places we visited. But it was helpful at times as a place to nap or even a seat for eating! 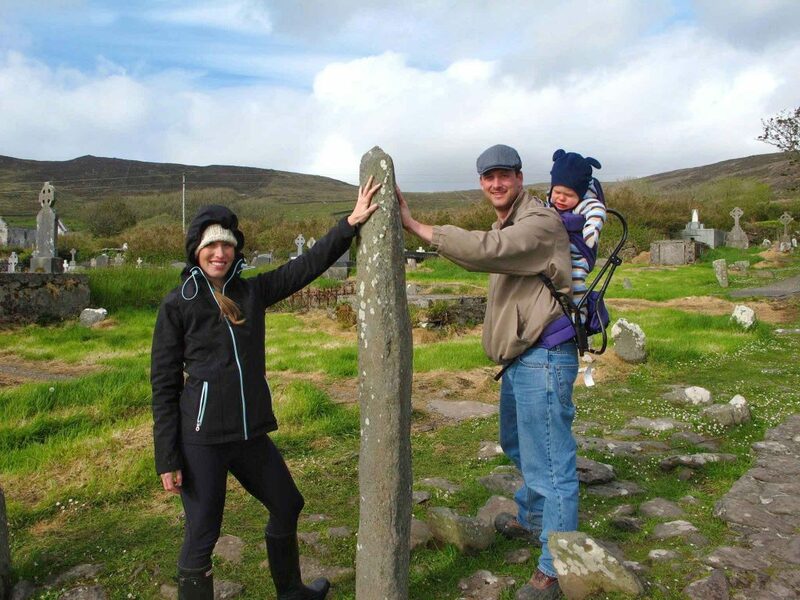 Don’t Stress about Time – Ireland is very much a go-at-your-own-pace kind of family adventure, especially if you have your own rental car. Eating at Restaurants and Pubs with a Baby or Toddler – Most restaurants and pubs offered a ”baby bowl” for young children in Ireland. It would usually consist of mashed potatoes and a cooked vegetable or soup. It isn’t on the menu, but you can always ask! In many cases we found that the baby bowl is free! Changing Diapers in Ireland – Some places do not have baby changing areas, so this may need to be done in the car or on the ground. Packing a small blanket or towel just to use for a changing pad is a good idea. 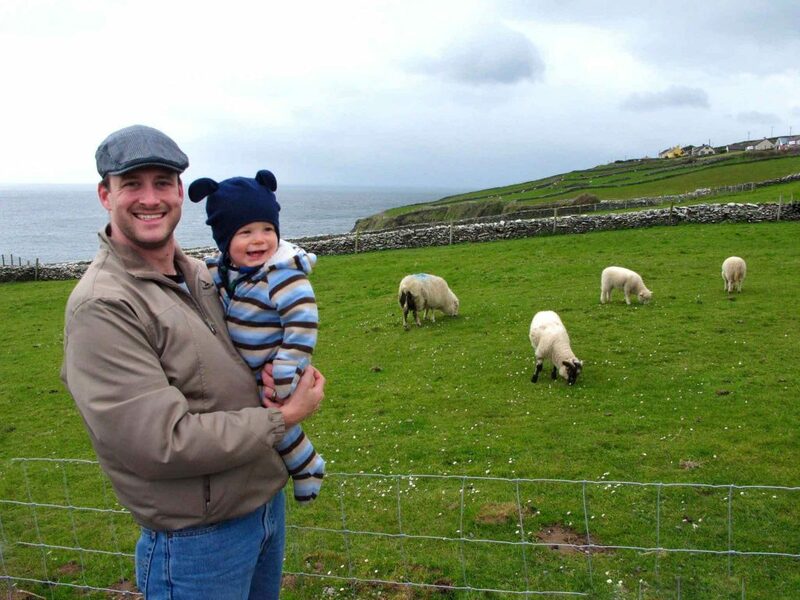 How to Dress Baby in Ireland – We found that the weather was constantly changing throughout the day. Dressing in layers is key! For babies and young children, it’s best to overdress. The weather could go from cold, rainy and windy to sunny and warm several times a day! We usually dressed our baby in a snowsuit while out exploring. Baby Essentials in Ireland – Baby essentials and food can be found at stores in bigger cities, so be sure to stock up for your trip when you can. 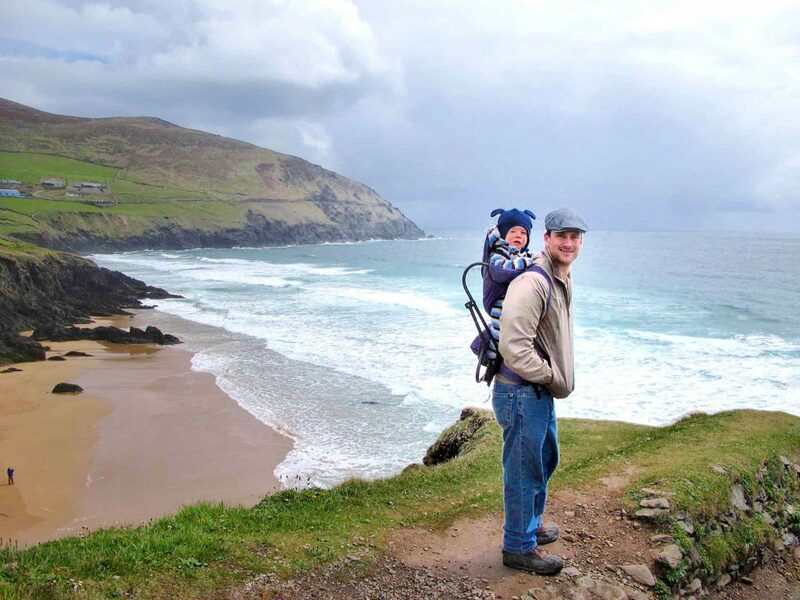 Getting Around with a Baby or Toddler in Ireland – A baby carrier or hiking backpack carrier will be the best option for exploring with a baby or toddler. See a list of the best baby carriers for travel or our review of the Deuter Kid Comfort 3 backpack carrier. If you plan to bring a stroller, bring a lightweight travel stroller that will also be good on rough terrain! 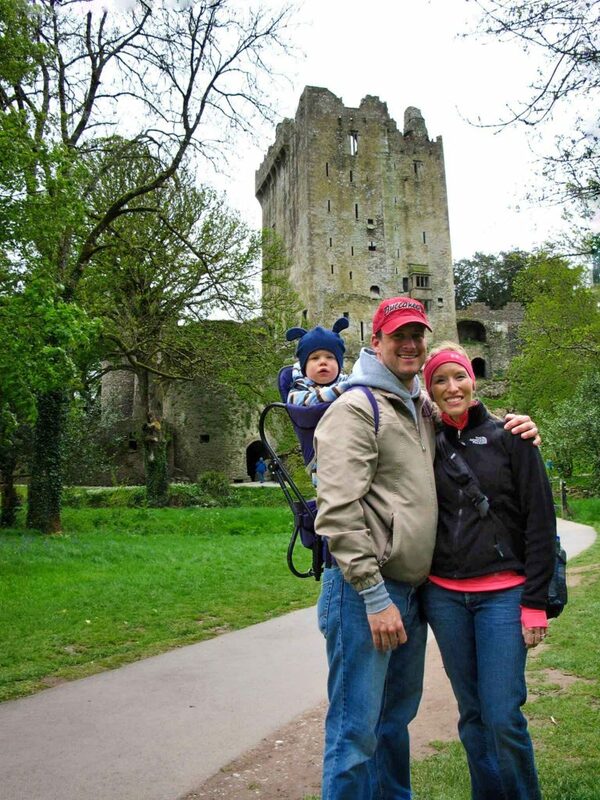 We assumed Blarney Castle was just a cheesy touristy area, where people go to kiss a stone and leave. That presumption was so wrong! I recommend planning at least half a day to explore all that Blarney Castle has to offer. The gardens and walks around the area are gorgeous. 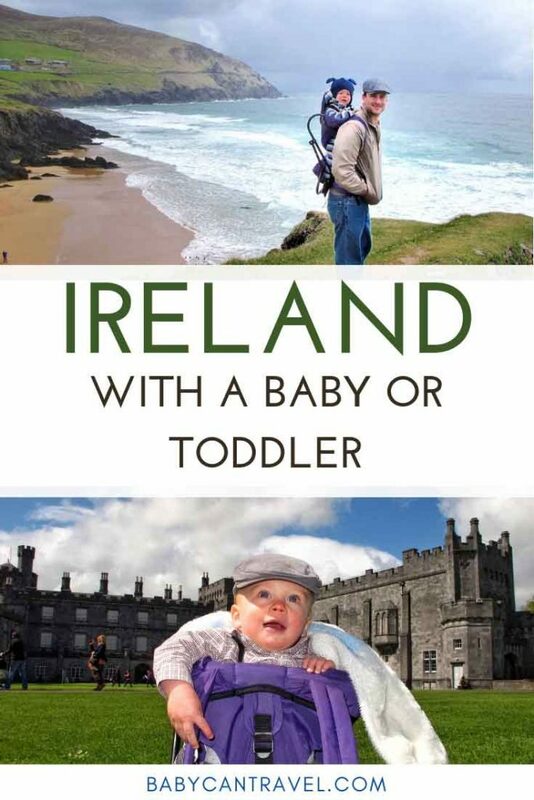 If you are visiting Ireland with a toddler, this is a great place to visit since there is plenty of room to let a toddler explore! We really loved the poison garden, but you really have to keep kids away from the plants! We had our baby in a hiking carrier while we explored. And of course, what trip to Blarney Castle would be complete without kissing the stone? 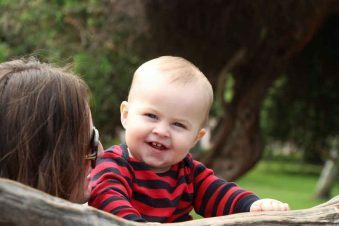 If you are flying with your baby or toddler, don’t forget to check out our tips for flying with a baby, our best airplane activities for babies and toddlers and these tips on flying with a toddler! 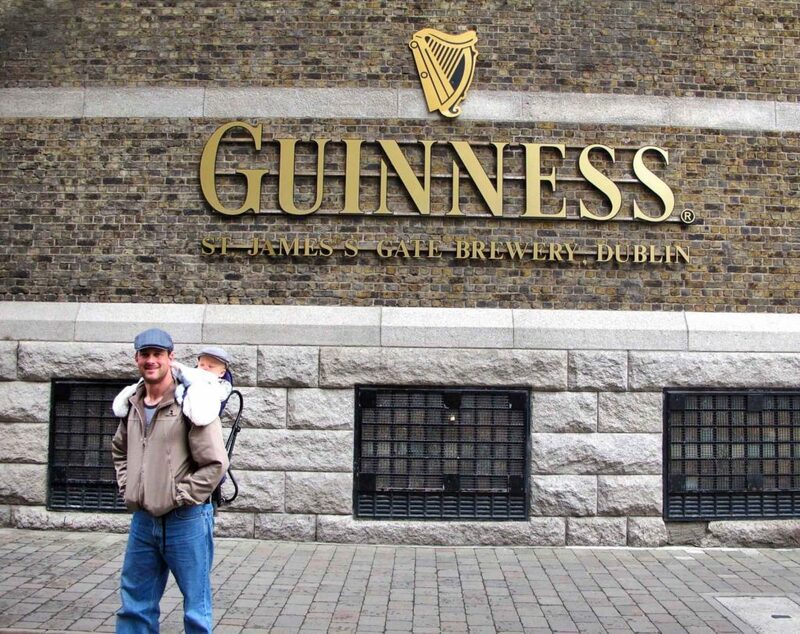 This was, by far, our favorite part of our holiday in Ireland with a baby. We took a day to drive around Dingle Peninsula and made several stops at ruins and ancient sites. The scenery along the rugged coast is unbelievable, we couldn’t stop hopping out of the car to take pictures of all the sites. If you like history and exploring castles then you’ll want to make a stop here. 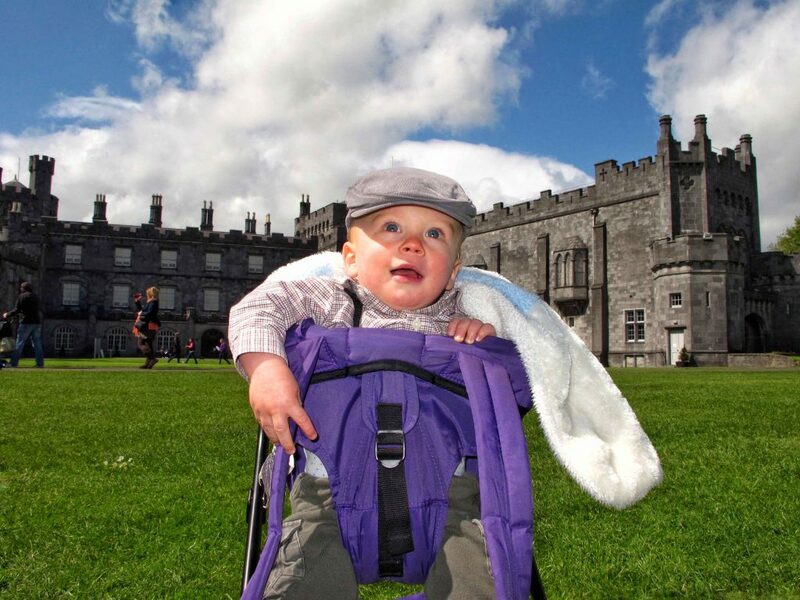 We used the baby carrier for touring inside Kilkenny castle, but there is plenty of beautiful outdoor space for toddlers to run around – making it another great place to visit in Ireland with a toddler. There is also a fairly new playground at the Castle Park on the property for toddlers to play. If touring the castle, tickets are fairly inexpensive at 8€ for adults, and children over 6 years old are 4€. The town of Kilkenny is cute to walk around as well. This is definitely for the adventurous momma and you’ll need the hiking carrier for this one. 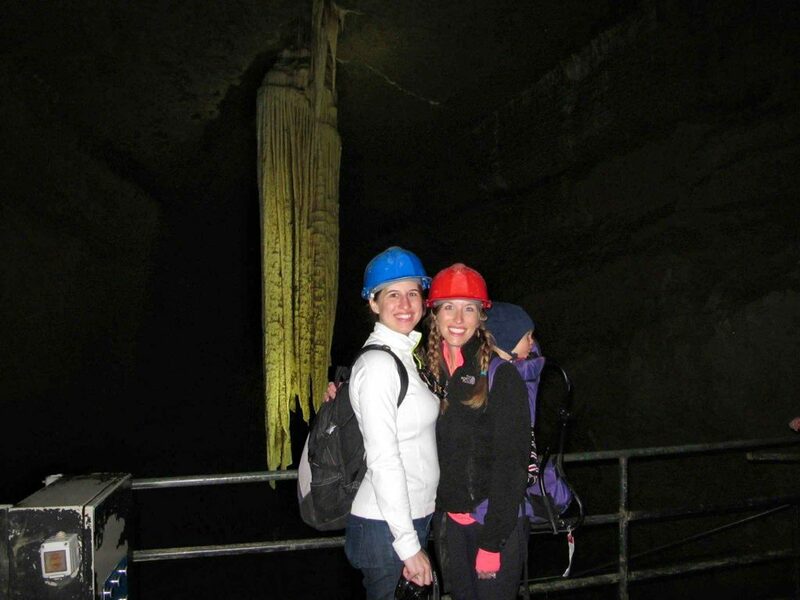 We visited Ireland with another couple, and while the men went golfing at Lahinch, the girls visited the Doolin Cave! The Doolin cave is home to the great Stalactite, which is the longest free-hanging stalactite in the Northern Hemisphere! We called ahead and made sure it was okay to do the Doolin cave tour with a baby in a hiking carrier. You need to be in somewhat decent shape to be able to ascend and descend the steps in the cave with the weight of the baby in the carrier, it’s quite the workout! It really was a fun adventure! The prices for the cave tour are 15€ for adults and 8€ for children, and they even have family packages! If you book online you can also save 20%. This was not originally on our itinerary but decided to take the extra time to visit. I’m so glad we did! We were lucky to have a sunny, warm weather day. I’d definitely recommend going when it is warm to be able to fully enjoy the outdoors! 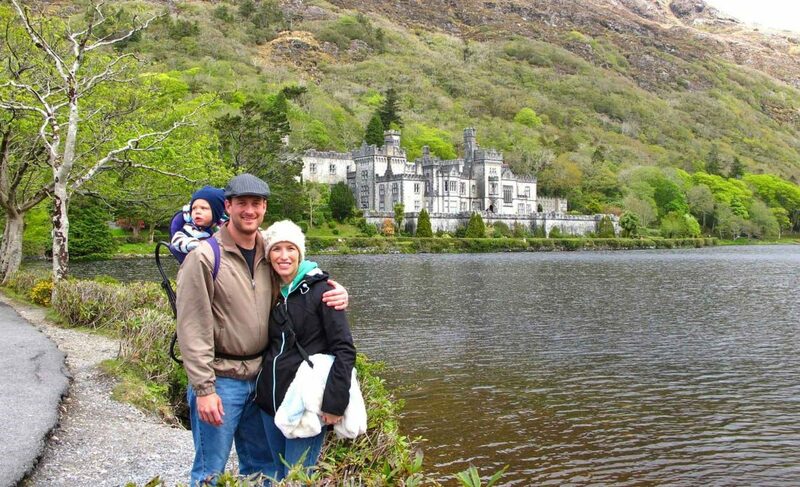 The Kylemore Abbey was originally a castle, and now the Benedictine order of nuns own and use the property. You can tour parts of the Abbey as well as the church and woodland walking paths. The best part of this place was the walled Victorian Garden! The pathways are mostly gravel, so depending on your stroller, you may want to use a baby carrier. There are several cafés on site with kids activities and play areas. Adult tickets are 13€, children 12 and under are free, and they also offer discounts for families. 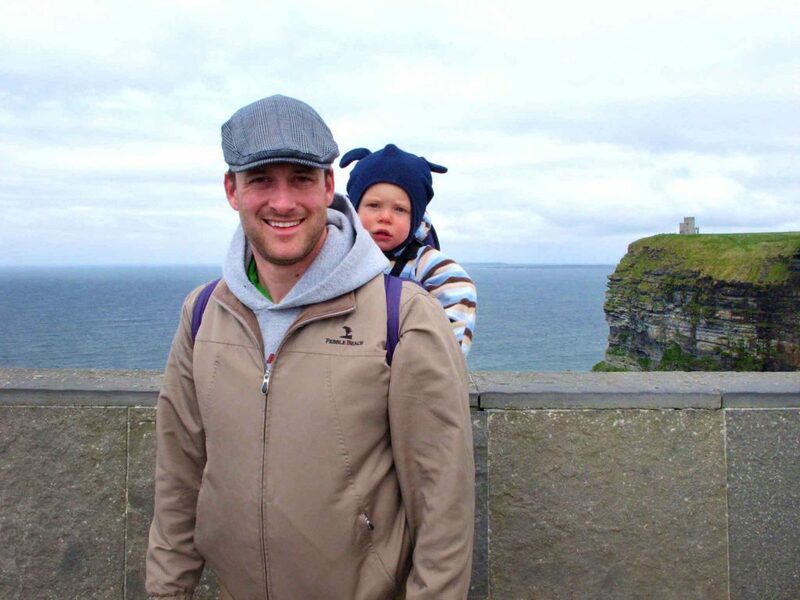 The Cliffs of Moher is definitely a MUST SEE when visiting Ireland, even if you are traveling with toddlers or a baby. I would plan at about two hours to explore the area. Depending on the time of year, you may be able to spot interesting wildlife, such as puffins! There are plenty of paved walkways around the viewing sites, making it easy to use a stroller at the Cliffs of Moher with a toddler or baby. The visitor center has some activities and information, as well as a family friendly café and diaper changing station. Tickets at the entrance are 8€, however if you book online, you can save 50%. Children under 16 are free! Our trip ended in Dublin, and we didn’t have much time to explore. We chose to do the tour at Guiness Storehouse. 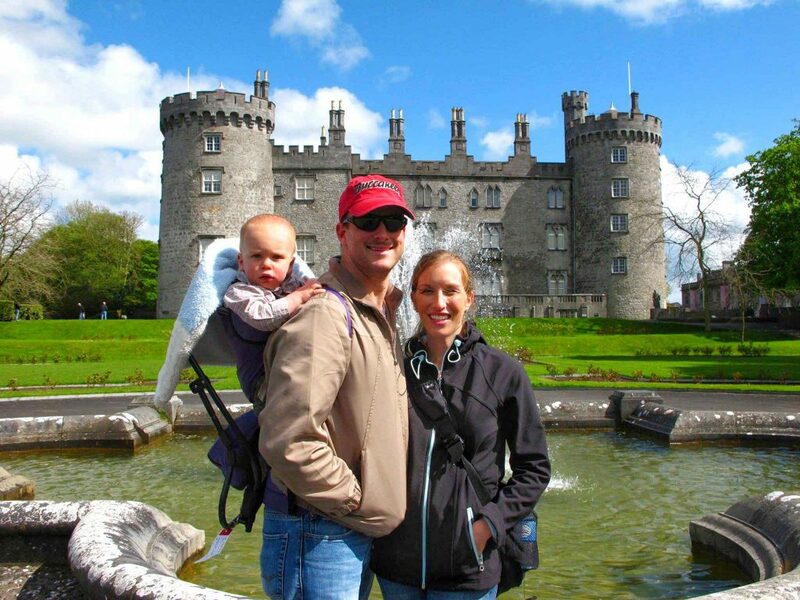 The tour is go-at-your-own-pace, which is great for families traveling to Ireland with kids. We enjoyed learning about the history of Guinness and process of making beer. At the end of the tour you can use your “free pint” ticket at the Gravity Bar, which is included with admission, to have any beer you choose! The Gravity Bar has excellent views of Dublin and a great place to kick back. We used the baby carrier for this experience, but the stroller would have been just as fine! Tickets are 25€ at the door (discount tickets available online), and children 13 and under are free. Book an early time slot to avoid crowds and lines. We also opted to skip the expensive on-site restaurants and eat elsewhere. Thank you to the The Flying Hens for this guest post!